The power of Smart Hustle Magazine is that we are creating a community of small business owners. On our website, you will find business tips, news, and inspirational interviews. We also recently launched a Smart Hustle Community Facebook Group where small business owners can network, give advice and get advice. While everyone is pursuing their own individual hustle, we are even stronger and more powerful when we come together as a group. This is one of the main principles of Smart Hustle, and I was excited to hear that it was also embraced by David Smith, the CEO of a new online community called Knokal. I caught up with David at SXSW 2016 when I stopped by his booth to learn more about the company. 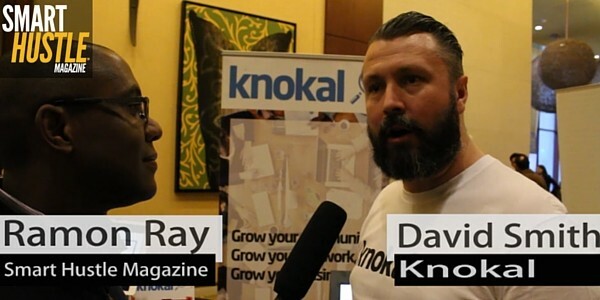 As David explains in our interview, Knokal (a play on ‘local’) is a B2B website aimed at connecting small businesses. The idea for Knokal came as David observed his sister’s business during the various stages of development. As she took the business from hobby to career, she had to find the right partners to grow the business, including web development, PR marketing, and more. The process was difficult, with a lot of dead ends and companies that just weren’t a good fit. As every business owner knows, when you’re getting started it’s important to find partners that are compatible with your business. Finding partners that are compatible and care about your business is a lengthy and often expensive process. Compatibility is also crucial when individuals are searching for a life partner, and nobody does it better than Match.com. David’s idea was to create a sort of “Match.com for businesses” to make it easier for small business owners to find customers and partners. Find the right B2B connections for your #business. See how @knokaldotcom can help. As a result, small business owners are able to find the right partners to grow their business, network with other businesses, and market to potential customers. As David mentions, it’s meant for business owners who want to educate themselves and learn more about the businesses around them. The platform has the option to store contact information, to send messages to your matches, and to track your Knokal analytics. Knokal is an Australian-based company that launched just a few weeks ago. They plan on coming to the U.S. in June or July to do a soft launch in Austin and inform American businesses about the new website. I appreciate the fact that David understands that small business owners have ‘power in numbers,’ a guiding principle of Smart Hustle. Knokal looks to be a community-oriented tool that can help small business owners find compatible partners and customers to help grow their businesses.